A certain farmer wanted to create a special orchard in the vacant field next to his house. He had been given ten special apple tree saplings: a Pink Lady, a CandyCrisp, a Fuji, a Cameo, a Granny Smith, a McIntosh, a Jonagold, a Red Delicious, a Senshu, and a Winesap. After careful consideration and planning it was decided that the apple trees would be planted so that there were five rows of trees with four trees in each row. When he told his neighbors about his plan they all laughed and told him it was impossible to plant ten trees so that you have five rows of trees with four trees in each row. A few years later the same farmer was given six more apple trees: a Stayman, a Fortune, a Cortland, a Honeycrisp, a Macoun, and a Northern Spy. 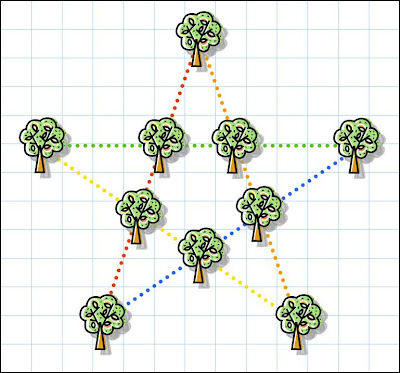 Six trees wasn't enough to create another star pattern of trees so he came up with a new plan. He changed the planned orchard and planted the six new trees so that all sixteen apple trees were placed in fifteen rows with four trees in each row. What did the farmer's apple orchard look like when he was done?